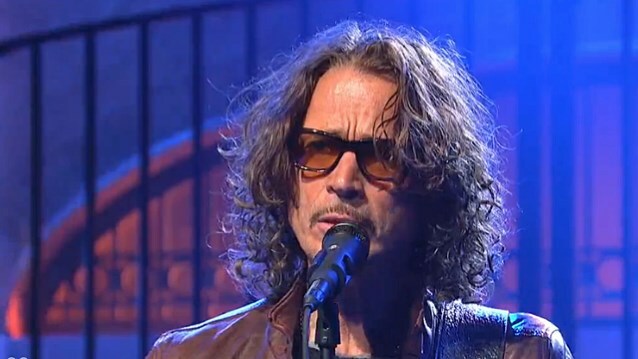 According to TMZ, Chris Cornell used "red elastic exercise band" to take his own life after performing at a concert in Detroit Wednesday night. Sources tell the site that the SOUNDGARDEN frontman secured the band attached to a carabiner to the top of his hotel bathroom door. A carabiner is a device commonly used by mountain climbers which they attach to a belt to keep them from falling. The device can withstand enormous weight. Cornell jammed the door shut with the carabiner at the top of the frame. The carabiner was jammed so tight it left an indentation in the door frame. A police report obtained by The Detroit News reveals that Cornell's wife asked his bodyguard to check on him in his hotel suite because she became concerned when her husband kept repeating "I am just tired" in a telephone conversation with her a short time earlier. The bodyguard, Martin Kirsten, went to Cornell's room in the MGM Grand Hotel just after midnight and kicked two doors open — the front door as well as a second door leading to the bedroom suite — before finding Cornell slumped on the bathroom floor "with blood running from his mouth and a red exercise band around [his] neck." According to the police report, which was filed by officers from the Detroit Police Gaming Unit who responded to the scene, Kirsten was in Cornell's room late Wednesday night to help him fix his computer and to give Cornell two Ativan pills, "which victim takes for anxiety." MGM medic Dawn Jones arrived at the room at 12:56 a.m., the report said. "Jones untied the red exercise band from [the] victim's neck and began CPR on [Cornell, who] was not breathing." At 1:30 a.m. on Thursday, Cornell was pronounced dead by a doctor who came to the scene, the report said. On Thursday afternoon, the Wayne County Medical Examiner's Office announced Cornell's cause of death "has been determined as suicide by hanging." But, it added, "A full autopsy report has not yet been completed." Cornell's family issued a statement Friday questioning whether his death by hanging was intentional and if "substances contributed to his demise." Cornell family's attorney Kirk Pasich added in a statement that the family is "disturbed" by inferences that Cornell knowingly took his life. "Chris, a recovering addict, had a prescription for Ativan and may have taken more Ativan than recommended dosages," Pasich said. "The family believes that if Chris took his life, he did not know what he was doing, and that drugs or other substances may have affected his actions."